Red panda Bear - Thought they are called pandas and Red Panda Bears, Red Pandas are not bears. A long debate ensued as to whether or not Red Pandas were in fact bears, in the same manner as the Giant Panda. However, it was determined that both Red Pandas and raccoons were related; however they were not related to the Giant Panda. This became evidenced after studying the DNA of Giant Pandas and comparing them with the DNA of Red Pandas. Though there were some similarities between Giant Panda and Red Panda in behavior, the evidence concluded that Red Pandas are a member of the Raccoon family, and not the bear family. Calling them Red Panda Bear or Red Panda Bears is improper. Red Pandas are classified as Ailurus fulgens which means, "shining cat". Additionally, Red Pandas are also known by several other names including Lesser Panda, Firefox, Red panda Bear and Fire Cat. There are two subspecies of Red Pandas; these are the much larger Styan's Red Panda and the Western Red Panda, which is identified by having lighter fur in the face and muzzle area. Fully grown, Red Panda (Ailurus fulgens) weigh between 6-14 pounds. Their length, including head and body, measures between 20 and 24 inches, with their tails measuring between 11 and 18 inches. Adult red panda males will weight between ten and fourteen pounds, as red panda females are slightly smaller, weighing in between six and ten pounds. Like it’s cousin, the Raccoon, Red Pandas are approximately the same size. They are also comparable to the size of a housecat. Easily identified with their reddish fur and brown and black tail. Red Pandas legs as well as their undersides are also brown or black. Their faces are white surrounding the eyes and muzzle, with two distinctive reddish brown stripes across the cheeks. The markings of Red Pandas are quite similar to those of the raccoon. Like the Giant Panda, Red Pandas have a small thumb on their forepaws. This thumb is used to grip the roots, and stalks of Bamboo when eating. Their teeth are broad and the sides are flat, this enables them to vigorously eat bamboo and roots. Red Pandas breed once they've reached the age of eighteen months. Breeding seasons are between the months of January and March, and they typically give birth to two or three babies. Their gestational period is between 114- 145 days and they tend to breed every one to two years. Though the Red Panda baby will remain with their mothers for nearly 90 days, the fathers show very little concern for them. Adult Red Pandas live solitary lives and only interact for mating purposes. 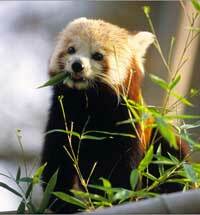 The Bamboo Himalayan Forests of China make the Red Panda habitat. They share some of the same habitat as the Giant Panda, but they prefer higher altitudes. Due to the amount of deforestation taking place in the Himalayan Forest, the Red Pandas home is becoming threatened. Conservationists are keeping a close and watchful eye on the Red Pandas, as they are endangered. It is believed that there are about 2,500 adult Red Pandas left in the wild, and it is believed that the total population of Red Pandas is less than 10,000. Additional habitats include the forests of Myanmar. They are also seen in Nepal, or northern India. Red Pandas feed on bamboo, but they also eat bird eggs, insects, and even small birds. Red Panda also enjoy fruits, sap from trees, leaves, roots, and grass. However, though they will occasionally eat meat, Red Pandas are primarily herbivores. Red Pandas aren't nocturnal, but rather are Crepuscular, meaning that they prefer the twilight hours of dawn and dusk. During the daylight hours, Red Pandas tend to sleep or rest. Their natural habitat is trees, and they spend the majority of their day in trees or in a hollow they have made a den in. Extremely agile, Red Pandas spend much of the dusk running through forests, finding food. They are also very sensitive to heat and prefer temperatures between 62 and 77 degrees Fahrenheit. In fact, if the climate reaches temperatures above 77 degrees Fahrenheit, you will find Red Pandas seeking the cool comfort of a cave or treetop, sleeping with their tails across their faces. To help increase the amount of Red Pandas, conservation efforts have been initiated. In the wild, Red Pandas life expectancy can range between 8-10 years, but through successful conservation and breeding techniques they can live in excess of fifteen years. Gestation: 4 to 6 months. Average 5 months. Red Panda Predators: human, snow leopards (adult pandas), and martens (family Mustelidae) are the main predators of red panda cubs.